I wrote a couple of weeks ago about an idea I had for a college football game. The basic premise: play an entire season in 15 minutes. Recruiting mini-game, plus individual games resolving at the quarter level instead of the play level. Individual games would play in less than 90 seconds. However, I had a problem, and it was a big one: individual games were hot garbage. Resolving a game at the quarter level just doesn't work. If there's a points card that each player bids on, it "works" in the sense that a final score results after four rounds, but it has nothing to do with football. Everything at the quarter level, no matter the rules, felt nothing like football. Well, that won't work, obviously. Resolving a single game in less than 90 seconds only works if there's a football feel. Without that, it's just a random card game with images of football on top. Those images could be Vikings or giraffes or whatever--there's no actual connection to anything. So I thought about that, and thought about it some more, and then got pissed off at myself because I couldn't solve this little problem that was much bigger than it originally seemed. Saturday, I sat in a car in a parking lot for three hours. 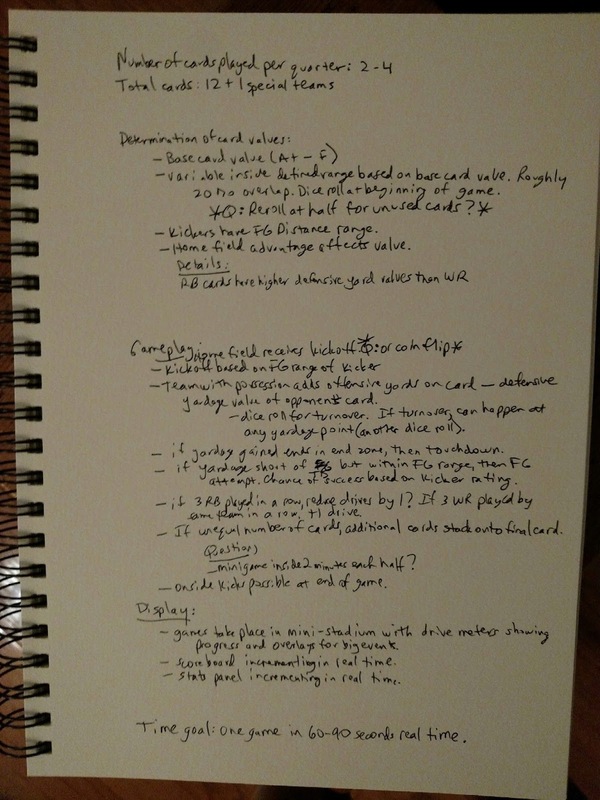 It was a nice day outside, not hot, and I needed to pick up Eli 14.9 from a school event at a certain time, so I just went ridiculously early and stared at my design notebook for a long, long time. Then, suddenly, I realized what was wrong. Resolving by quarter doesn't resemble football because it's not football. Quarters are just a way to organize time. The next level up from resolution at the play level isn't resolution by quarter--it's resolution by drive. The drive is a fundamental part of football. Once I realized that, ideas started coming very quickly. 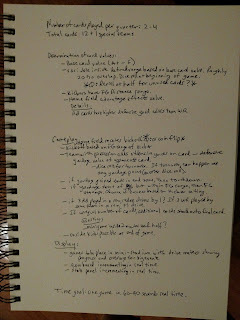 It only took about forty-five minutes to sketch out a rough design for the in-game mechanics. This actually feels like football, and using the "players" you recruit in the game gives a direct connection to the value of the recruiting process. You'll develop a much more personal relationship with your players. There is a ton of work left to do on the design, but I think at the conceptual level this makes complete sense. So I think this is the correct approach, and I think it will be much, much simpler to get a prototype running than it was with Gridiron Solitaire. If you have ideas, send them. I didn't involve you guys in Gridiron because I hadn't done a game before--didn't even know how to program--and I was incredibly self-conscious about saying "Hey, I'm making a game!" until I had an actual game to show. This time, though, I'm not concerned about any of that, and the game will be much better if I incorporate your ideas as development goes along.